THE two finest liners on the United States Line’s service to and from Europe are the Manhattan and the Washington. These luxuriously-equipped liners are sister ships, each of 24,289 tons gross. They have a speed of over 20 knots and run between New York and Ham-burg by way of Cobh (Queenstown), Ireland. East-bound, they put in at Plymouth and Havre, westbound at Havre and Southampton. The Manhattan and the Washington have an identical external appearance, with a straight-raked stem and counter stem. The two elliptical streamlined funnels are widely spaced and painted red with a white band and a blue top. The hulls of both vessels are painted black and their superstructures white. Internally, the two ships differ slightly. The Manhattan accommodates 1,239 passengers in cabin, tourist and third classes, and the Washington 1,100 in the three classes, as she has a smaller tourist-class and third-class capacity. Each vessel carries a crew of 478. The great liner Manhattan towers above the tug Steinhoft in Hamburg Harbour. The tug is 82 ft 9 in long and the Manhattan 668 ft 5 in long. 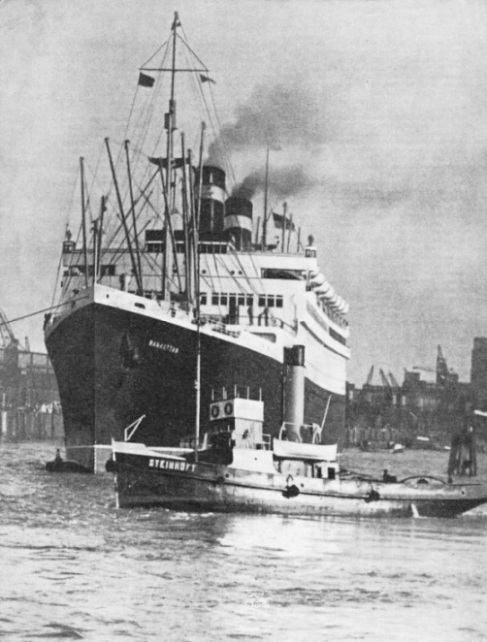 The Manhattan and her sister ship the Washington are on a regular service between Hamburg and New York. These sister ships are identical in every feature except for certain differences in cabin accommodation. The two vessels were built in the shipyard of the New York Shipbuilding Company at Camden, New Jersey, on the east side of the Delaware River, opposite Phila-delphia. The elder ship, the Manhattan, was the first vessel for thirty-five years to be laid down in an American shipyard as a liner for the North Atlantic trade. Her keel was laid on December 6, 1930, and she was launched almost exactly a year later, on December 6, 1931, by Mrs. Edith Kermit Roosevelt, widow of President Theodore Roosevelt. 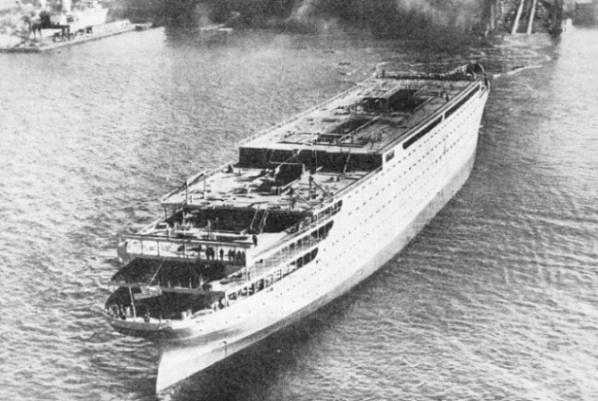 The Manhattan left New York on her maiden voyage on August 10, 1932. Ten days later, on August 20, the Washington was christened with water from the old spring at Mount Vernon, George Washington’s estate on the Potomac River. She started on her maiden voyage from New York on May 10, 1933. 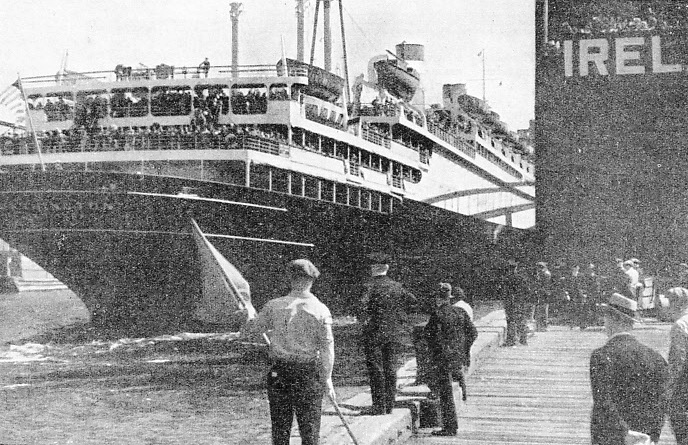 Launch of the Manhattan, 24,289 tons gross. She was built by the New York Shipbuilding Co, at Camden, New Jersey, on the Delaware River. Her keel was laid on December 6, 1930, and she was launched by Mrs. Theodore Roosevelt on December 5 in the following year. When these two vessels were put into service they were the fastest passenger liners of the cabin class in the world. They were designed to offer new luxuries at moderate rates. Before the Manhattan and the Washington were built, the St. Louis and the St. Paul, belonging to the American Line, had been the largest American-built ships of their day. The house flag of the American lane, the well-known blue spread eagle on a white ground, is flown by the Manhattan and the Washington. 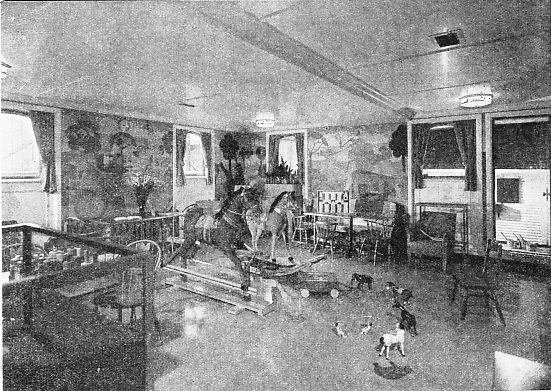 Children’s playroom in the United States liner Washington. This playroom is aft on the boat deck and is for the use of the children of cabin-class passengers. The decorations on the walls of the playroom and elsewhere in the ship are painted by Aldo Lazzarini. Toys and games of every kind are provided and a stewardess is in charge of the playroom. There is a similar room in the Manhattan. The dimensions of the two liners are identical. Each has a length of 668 ft 5 in, the moulded beam of each vessel is 86 ft 3 in and the depth to the promenade deck is 75 ft 3 in. Motive power is supplied by two sets of triple-expansion turbines geared to two propeller shafts and developing a shaft horse-power in service of 30,000. There are eight passenger decks in the Manhattan and in the Washington. In addition to the sun deck, boat deck and promenade deck, there are five passenger decks-A to E. Another deck extends forward of the machinery space and over part of the space aft. So carefully has every detail been considered that passengers wishing to take dogs will find on the sun deck large, airy kennels, complete with port-holes and steam heating. The sun deck, between the two funnels, is about 4.000 square feet in area and has a full-size court for lawn tennis and space for deck tennis. Forward is a steel house enclosing the wheel-house and chart-room. The spacious promenade of the boat deck is not hampered by the lifeboats. These are carried on patent davits that raise the boats to the level of the aim deck. Each of the standard lifeboats, which are built of copper-bearing steel, is 30 feet long and 10½ feet beam and carries eighty-four persons. Sixteen of the lifeboats are on the boat deck mid four of similar type are aft on A Deck. There are two wooden motor lifeboats aft on the promenade deck. The motor lifeboats are 30 feet long, with a beam of 8 ft 8 in, and can proceed at eight miles an hour when fully loaded with passengers. The motor lifeboats are propelled by petrol engines and are equipped with radio for sending and receiving messages. Enough fuel is carried to cruise 200 miles. On the boat deck aft are the cabin-class children’s playroom and the wire-enclosed play-decks that have their exits through the playroom to prevent the children from straying. The officers’ quarters are in two houses on the boat deck. The captain’s office, stateroom and bathroom are on the starboard side forward, and the chief officers’ quarters to port. Navigating officers, wireless operators and a few engineer officers occupy the rest of the cabins forward. In the after-house are the messrooms and quarters for the chief engineer and his staff. The eight passenger decks of the Manhattan are shown in this sketch. The sun deck is amidships above the boat deck. F Deck is a small deck extending forward of the machinery space and not used by passengers. 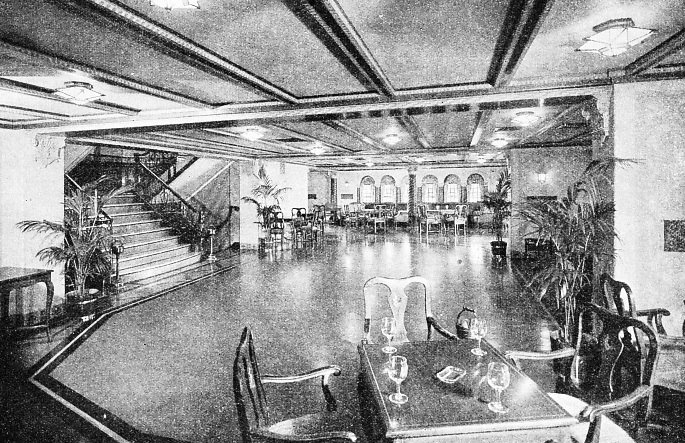 The grand salon can be seen reaching from the promenade deck to the boat deck. The external appearance of the Manhattan is identical with that of the Washington. The public rooms on the promenade deck represent the height of magnificence and luxury. Aft is a café decorated in the Venetian style and opening onto a games deck. The smoking lounge, with its log fire, surrounds the passenger with the atmosphere of pioneer America. The murals by Lazzarini depict the life of the Redskins. Forward of this lounge are the Elizabethan library and the Hepplewhite writing-room. Then comes the grand salon, two decks in height, decorated, in the Georgian style and with a large, shallow central dome. Below, on A and B Decks, are twelve suites, each with living-room, bedroom, foyer, trunk alcove and bath and shower. Standing beds are provided and the Pullman upper berths disappear into the ceiling when not in use. The decorations of the suites are distinctive. The Monticello and Fairfax suites are modelled on Southern Colonial lines. Louis XVI decorations characterize the Marie Antoinette and Trianon suites. The Devon and Stratford suites are in the Adam style and the Marquette and Frontenac suites in the French provincial style. Two Early English suites, Hampton and Rushbrooke, and two in later English style, Kensington and Pem-broke, complete the number. All are finished in polished hardwood panelling or painted panels. The cabin foyer on B Deck is spacious and has been arranged for use as a lounge. The beauty parlour, manicure parlour and barber’s shop adjoin this lounge. The doctor’s surgery and dispensary are aft, adjoining the tourist lobby. On C Deck are the main dining- rooms for cabin and tourist passengers, separated by a main galley with service doors at either end. The cabin dining-room is in the Louis XVI style, with mural paintings by Lazzarini, portraying the three ships of Columbus and the landing from the Mayflower. Aft are a number of tourist cabins. Forward are state rooms and shops. The fore-part of D Deck is occupied by crew’s quarters; the swimming pool and state rooms for cabin passengers are aft. The third-class cabins and dining-room are aft on E Deck. Forward of these are various store rooms, messrooms and quarters for the crew. F Deck extends forward of the machinery space and aft only over the after peak tank and in way of No. 6 Hold. Designed built and installed by the New York Shipbuilding Company, the propelling machinery develops a normal output of 30,000 shaft horse-power to maintain a speed of over 20 knots in moderate weather. An overload can be developed up to about 34,500 horsepower by the use of extra nozzles on the high-pressure turbine. There are two sets of triple-expansion turbines actuating through single-reduction gearing. Either set consists of a single-flow high-pressure, a single-flow intermediate-pressure turbine and a double-flow low-pressure turbine. Each turbine is in a separate casing and drives its own pinion through a flexible coupling. Astern power is provided for in every unit. The high-pressure astern turbine is in a separate casing located in tandem forward of the intermediate-pressure turbine. It drives the intermediate pressure pinion through the flexible coupling in the astern direction. The low pressure astern turbine is incorporated in the forward end of the low-pressure ahead casing. The total output of-the astern turbines is 65 per cent of the ahead power. Turbine speed is about 1,500 revolutions a minute for a propeller speed of 125 revolutions when developing 5,000 horse-power for each turbine stage. For the propelling machinery, turbo-generators, auxiliary feed, pumps and other steam-driven pumps, steam is generated in six water-tube boilers of the Express type built by Babcock and Wilcox. These boilers are designed for burning fuel oil under forced draught with pre-heated air and closed stoke-holds. Pressure in the steam drum is 409 lb per square inch and 401 lb per square inch at the superheater outlet, with the steam superheated to 675° Fahrenheit. The boilers are in two separate compartments, separated by the auxiliary machinery room. The steam generating heating surface of each boiler is 10,500 square feet and the furnace volume is 1,262 cubic feet. Bound for Europe, the Washington leaves Pier 60 on the North or Hudson River in the Port of New York. Her next port of call is Cobh (Queenstown) Ireland. She then goes to Hamburg, pitting in at Plymouth and Havre. Westbound she calls at Havre and Southampton. The Washington and her sister ship the Manhattan attain a speed of over twenty knots. Independent forced lubrication systems are installed for the port and starboard propelling unite. The oil is drawn from sump tanks under the reduction gears and pumped through duplex strainers and oil coolers to the bearings. A gravity tank is installed at a height to maintain pressure on the discharge system and to ensure a supply in the event of pump failure. Any fall of oil pressure below a certain amount automatically closes the main steam bulkhead valves. There are four lubricating- oil coolers and two lubricating-oil purifiers. There are storage tanks and a reclaiming tank fitted with steam-heating coils, and an oil separator for bilge and ballast water. An auxiliary space is provided at the centre-line of the ship in the hold between the two boiler rooms. A flat or partial deck divides this space into an upper compartment for the turbo-generators and switchboard and a lower compartment for the condensers and their auxiliaries. The generating system consists of four 600 kilowatt turbo-generator sets, exhausting into two condensers, for which there are two two-stage air ejectors. There are various pumps in this auxiliary machinery space, also heaters and evaporators. The veranda café of the Washington situated aft on the promenade deck. This large room is decorated in the Venetian style, with iron-grilled windows and painted twisted columns. The veranda café, with its spacious dancing floor, opens directly on to the games deck. The public rooms In the Manhattan and the Washington are examples of the height of luxury achieved in transatlantic passenger liners. The starting platform is arranged for the greatest ease of operation. All telegraphs, gauges and indicator lights are in convenient positions. The gauge-board bulkhead, is placed so that only the band wheels of the steam valves are visible on the operating platform. The space housing the valves, steam-pipes and strainers is connected to an exhaust fan to eliminate, as far as possible, excessive heat. All the details described above apply to both the Manhattan and the Washington. The construction of the ships’ hulls is similarly identical. The steel hull is built with transverse framing. The depth of the double bottom is 6 ft 2-in throughout, except in way of the forward hold, where the depth is increased to 8 feet at the collision bulkhead. The flat keel, 4 ft 8 in wide, adds less than 3 in to the moulded draught. The vertical keel is continuous between the peak bulkheads and watertight except in way of double-bottom tanks Nos. 1, 9 and 10. On either side of the vertical keel amidships there are three side gilders. The oil-tight wing longitudinal bulkhead, extends the length of the boiler rooms and auxiliary machinery space. Fuel oil, fresh water, feed water and water ballast are carried in the seventeen main tanks in the double bottom. To minimize rolling, bilge keels, 15-in deep, are fitted to the shell plating for a length of 250 feet. Frames are 3 feet apart for the greater length of the ship; this is reduced to 2 feet near the peak tallies. Eleven main transverse watertight bulkheads subdivide the vessel. Additional subdivision is provided by the longitudinal wing fuel tanks. Navigation equipment includes a gyroscopic compass system and a Sperry gyro pilot for automatic steering. In 1934 the Manhattan was equipped experimentally with a fog camera to determine the position of other ships within a range of from three to five miles, according to the density of the fog. The sister ships Washington and Manhattan have established themselves among the most popular ships in the transatlantic service. 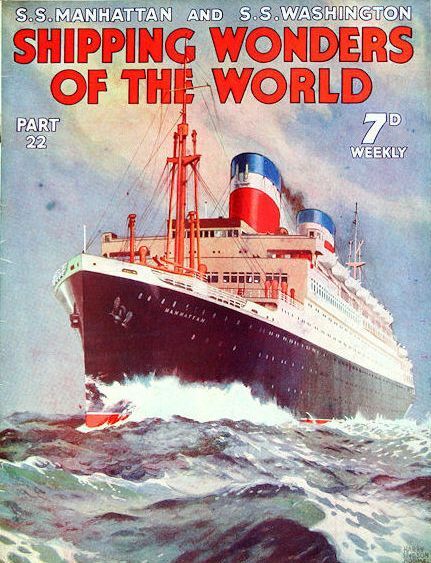 The SS Manhattan as depicted on the cover of part 22 by Harry Hudson Rodmell.